Brazos Santiago Texas May 4th 1864 9 1/2 P.M. (1865) Dear Ellen Your letter of April 9th came to hand to day & as I am to be on guard to morrow & shall have no chance to write I have thought best to begin, at least, to night. I am grattified to learn that you are well and having such a pleasent time. I would have been well pleased to have heard that you had taken that school again. I think that, next to going to school, (a good one) it would have been the best occupation you could have gotten in to. I am glad that Mary is getting along so well towards getting an education. I admire her perseverence. I hope that she, as well as yourself, will go on. If you would take the right course you might get a good education while teaching. 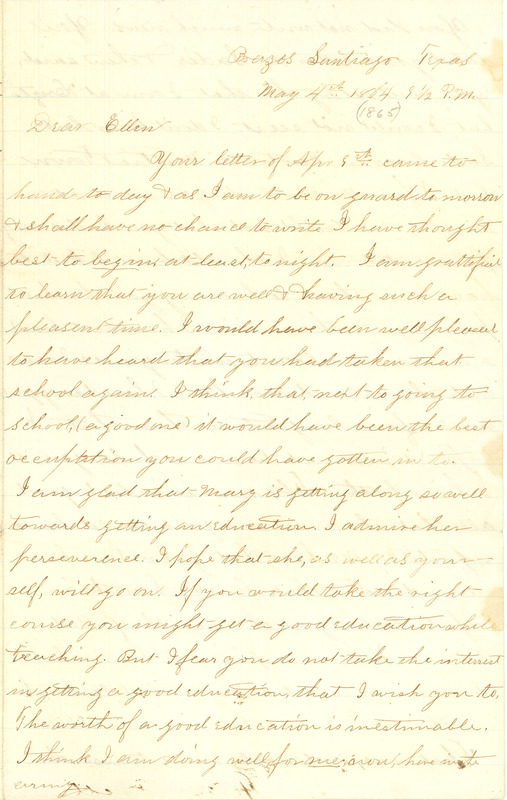 But I fear you do not take the interrest in getting a good education that I wish you to. The worth of a good education is inestimable. I think I am doing well for me, now, here in the army.